To start, be sure you check out Day 1 of this series if you haven’t yet. Today, on Day 2, I got to see what happens when trying to integrate the iPad into my professional life (whereas before I was living with the iPad on a weekend day). Can the iPad be a true productivity tool? Let’s go through Day 2! Like Day 1, today I started my day on the iPad to view my email. It’s a bit more comfortable waking up and sitting on the couch to check email rather than going into the office, hearing the buzz of the computer fan, and immediatly being thrown into the “work” state of mind. I figure that checking my email on the iPad was a good way to gradually bring myself into that work state of mind. But after checking a few emails and deleting ones that I didn’t need to respond to, I began to wonder: why couldn’t I have just done this in my office? Is it so bad to sit in front of an actual computer at 7:05AM? Is it worth paying $500+ for a device that let’s me be comfortable for a few minutes? I’m not so sure. After finishing up with emails that I had received while sleeping (this time on my desktop), I had breakfast and made some coffee. 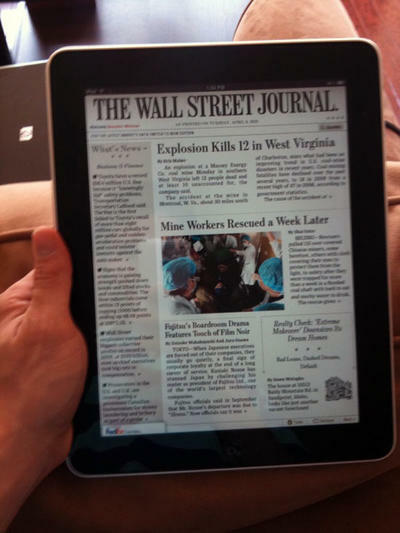 Ever since the announcement of the iPad, I had been looking forward to reading the Wall Street Journal on the tablet while sipping on some coffee. It seemed like a geeky dream to me. I really enjoy the WSJ, but the high cost to subscribe the newspaper (it’s around $150 per year for the print edition) kept me from reading it since graduating college (I used to get it for free through my university). I knew the iPad subscription price would be much lower than the print edition…and I was right. If you sign up with an online account, you can get the WSJ for about $8 per month. 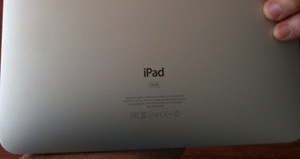 The advertised iPad price is actually double that, but for a limited time, you can get iPad access with the online price. So, how is reading the WSJ on the iPad? It’s….weird. The developers that made the WSJ app are obviously guessing on how a digital newspaper should function. No one really knows the proper interface a publication like WSJ should take on because tablet devices are uncharted territory. If the content is formatted like a webpage, it defeats the purpose of having the tablet-style form factor. The way the WSJ app works is pretty intuitive, but it doesn’t feel natural for some reason. You swipe to the right and left to go back and forth between pages. Then, to jump between sections, you tap the headline. Once in a section, you can access an index of all the articles within that section in a scrollable frame off to the right. It’s strange, and I really don’t know if I like it. I might just prefer going to WSJ online and reading the content there. This isn’t how I envisioned the tablet style of the WSJ functioning, but then again, I have no better format in mind. I’ll have to see how I get along with it in the coming days! After working for several hours, I wanted to take a break. Despite the iPad not having Flash, there are a ton of HTML5 websites out there which make video viewing right in the browser possible. You can see the list from Apple here. One of my favorite places to spend some time on the internet is TED.com. They’ve got video lectures from some of the world’s smartest people. Fortunately, this is one of the websites formatted for the iPad, meaning that you can get embedded video to play, or you can pinch the video outward to make it full screen. 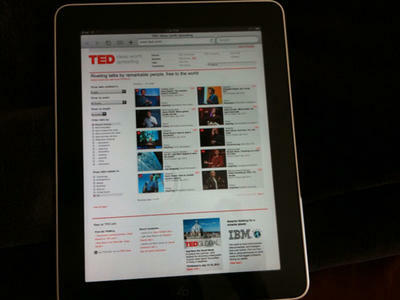 Watching TED.com videos on the iPad was a pleasant experience, and the video clarity was outstanding. Sadly, several times while streaming a video, my WiFi cut out. I’ve been having trouble with the iPad disconnecting itself from my WiFi network. No other devices on my network have have this issue, so I think it’s an iPad bug. I hope it’s soon fixed in a software update. It was time for another break at around 2:30PM. To keep my brain active, I wanted to read. I took out my iPad, booted up the Kindle application, and looked through my archived books, most of which included non-fiction. So I decided to download a work of Fiction. 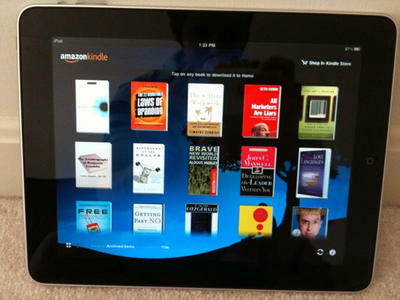 Thanks to there being multiple eBook stores for the iPad, I could shop around! Starting in iBooks, I saw that the price to read Lord of the Flies was around $8. Not satisfied, I checked the Kindle price, which was around $3. Score! I proceeded to download Lord of the Flies through the Kindle store, which happen indirectly. I was redirected to Amazon.com in Safari, where I logged in and bought the book. Then, I opened up the Kindle app again, and my book was downloaded within seconds. Not as seamless as the iBooks, but good enough. With Lord of the Flies on the screen, I ran into a problem. Since I have yet to buy the iPad case, I had no way to prop up the tablet. I can’t hold it in one or two hands…the 1.5lb weight is light, sure, but after a few minutes, it gets heavy. So, I propped it up against the wall, placed a pillow on my chest, and started reading. 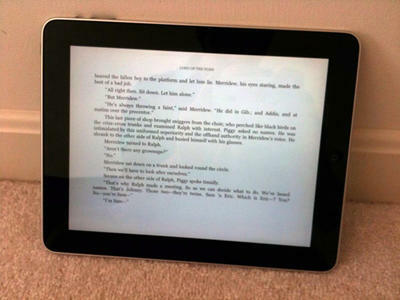 The Kindle app doesn’t allow for as much flexibility as iBooks. For example, turning into landscape won’t give you that cool side-by-side view. Nevertheless, I enjoyed the in-program text size picker, background color changer, and brightness control that the Kindle app provided. After about thirty minutes of satisfying reading, I had the familiar feeling of eye strain. Perhaps it’s just me, but after using the iPad for more than a couple of minutes, my eyes hurt for a while after. Maybe my brightness is too high, or maybe my eyes are having trouble focusing on the IPS display. Either way, I’ll need to keep a watch on this. Typically I have 20/15 vision, but after using the iPad, it feels like I need glasses. Weird. Time to chill out a bit. I searched the App store for something new and interesting to try, and came across a free app called Pro Keys. 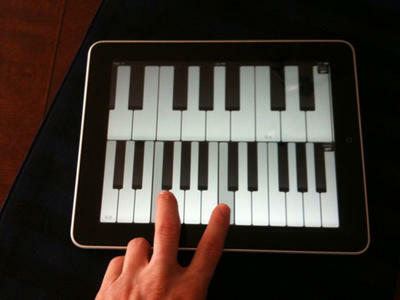 It’s a simple keyboard application that allows you to have two rows of keys with different sounds. The multitouch worked great, and I could even play a song. There are more robust (and expensive) piano apps in the App store that give you a greater range of playing choices. It’s funny because usually after buying a piece of technology I can easily answer questions like “Does this product improve my life?” or “Does this product make me more productive?”…but with the iPad, I still haven’t made up my mind. Since today was a work day, my focus was on productivity. I can say that while the iPad didn’t allow me to get more work done persay, it give me a choice in HOW I want to get the work done. Also at the end of Day 2 I’ve become seriously concerned with what the iPad is doing to my eyes in terms of the strain. Perhaps I just need to adjust further. We’ll see!